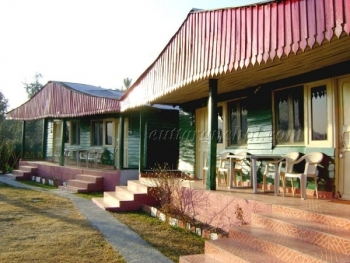 Blossom Resort is serving the tourists visiting Kausani from 1997. The Blossom Hotel & Resort has come a long way since its inception. And today, Blossom Resort stands as a cluster colorful small huts and cottages offering real countryside experience. It is surrounded with colorful flowers, shrubs, apples, peaches and plum trees. At Blossom Resort nothing will come between you and the Mother Nature. In Blossom Resort 70% area is open on which Children Park (with sea-saw and swing), Badminton court etc are situated . Children can also enjoy the swings and hammocks or just run around in our small playground amidst pine, tea bushes, Babugosa and hill lemon trees. Blossom Resort Kausani provides comfortable accommodation with splendid views at affordable prices. 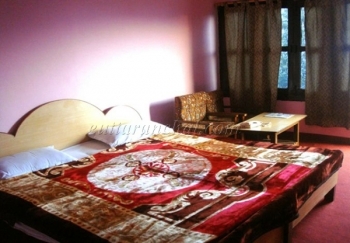 Hotel Blossom resort is located just below the VIP guest house in Kausani. Blossom Resort is situated at the best located of Kausani from where the whole range of sparkling Himalayas (370 Kms strech) with sun set and sun rise can be seen. Hotel Blossom is 17 Kms from famous Baijnath Temple and 42 Kms from Bageshwar. The accommodation in Blossom resort is categorized as Wooden Cottage, deluxe room and eco huts. Wooden cottages in Blossom Resort with attached bathrooms, dressing area providing comfort at its best. Every cottage has a double and four bed, two chairs, table and a dressing area - all made of pine wood. Deluxe Room is built using earthquake proof technology. Eco Huts are a new concept representing a 'pahari' (hilly) house with thatched roof and mud painted walls. All the rooms overlooks at the grandeur of Himalayas. You can have a variety of delicious home like food at Hotel Blossom Resort. The food is made by fresh vegetables and in a hygienic way. Visit Anashakti Ashram of Mahatma Gandhi, tea gardens and Baijnath temple as these are located in the vicinity of Kausani. Enjoy the immaculate beauty of nature rsquo;s several creations at one destination, Kausani. Play indoor games and outdoor games with your loved ones. Do short treks and other adventure activities. Extra Bed Charges : Child below 5 year is complementary and without any extra bed. Child 5 to 12 year will be charged 25% of package. Above 12 year 35% of the package. Kausani is well connected by motorable roads with major towns of Uttarakhand state. Kausani is located 53 kms from Almora, 79 kms from Ranikhet, 120 kms from Nainital and 410 kms from New Delhi. The nearest airport to Blossom Resort in Kausani is Pantnagar situated at a distance of 178 kms. The nearest railhead is Kathgodam located 142 kms from Kausani.